We Have Listened! After lots of Request from lots of Students and Teachers, Presenting E-books of Odisha Government School's Text Books. 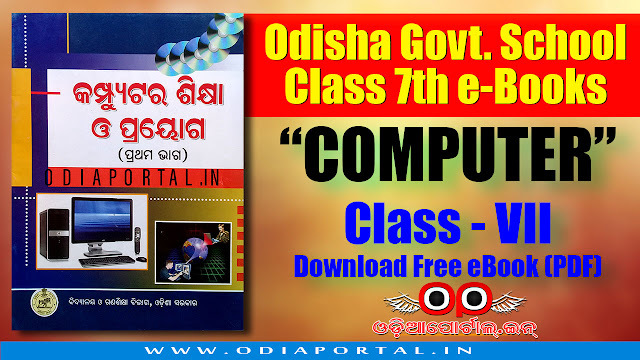 In this post you can download Class 7th (VII) Computer  "କମ୍ପ୍ୟୁଟର ଶିକ୍ଷା ଓ ପ୍ରୟୋଗ [ସପ୍ତମ ଶ୍ରେଣୀ]" e-Book PDF for free! NOTE: This Book, Its Graphics, Contents, etc are copyrighted by Schools and Mass Education, Govt of Odisha. This eBook is uploaded to Study.OdiaPortal.IN by OdiaPortal.IN for EDUCATIONAL PURPOSE "only" and to support for DIGITAL INDIA.